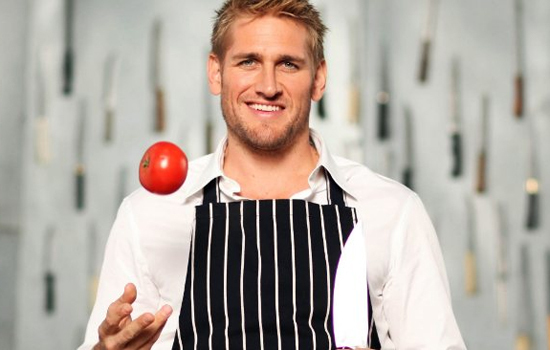 THE CELEBRITY APPRENTICE, TAKE HOME CHEF – Curtis Stone’s $120 Dish! 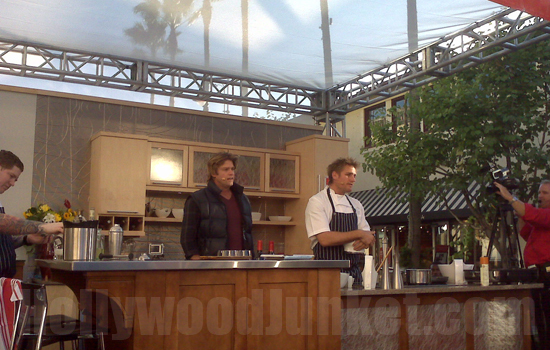 HOLLYWOOD JUNKET got footage of celebrity chef and reality show star from “The Celebrity Apprentice” and “Take Home Chef” while he was cooking at The Grove this weekend. Stone was there to shoot an infomercial for the cabinet brand Merillat that he endorses. We shot our own footage below. Stone signed autographs and answered questions after his demonstration. Curtis started out by making a cocktail with pears that included ginger, sugar and lime zest and lime juice, and water, as well as syrup and ice. Stone talks about his trip of traveling to a dozen countries in three weeks and says he’s glad to be back in Los Angeles. While shaking the cocktail, Stone cues “Shake It” song by Metro Station, Eric Stromer (D.I.Y. pro) proceeded to give a front row audience member a lap dance. Stromer comments that “most of the time you cook with Curtis, you’re just drunk”. Stone responded “especially when the food is bad”. Stone worked on making mashed potatoes onstage. With the assistance of Stromer who was having trouble working the masher, Stone commented that Stromer is an “incredible” builder and fixer. Stromer joked, “but I can’t mash potatoes”. Recipe – Add two egg yolks to the potatoes, and 2 tablespoons of flour, then stir but not too much. Add about one cup of sour cream. Stone said that he stays in shape by, he joked, doing work around the house. But, seriously, he said he surfs and runs with his Golden Retriever. Recipe – Cook sherlots, and roast the chanterelles mushrooms. Audiences laughed when Stone said “let me show you something in my drawer. The last few inches goes in slow. They call it the soft push”, as he referred to the way the drawer closes. Eric Stromer (left) and Curtis Stone (right). Truffles he used grow underground. Stone said the only way to find them is to use a trained dog to sniff them out. The grower digs them up, cleans them with a toothbrush. They are very delicate. Because they had a bad growing season, the truffles are priced at $2800 per pound. When the dish was finished, Stone said that it would cost $120 for the dish in a restaurant.